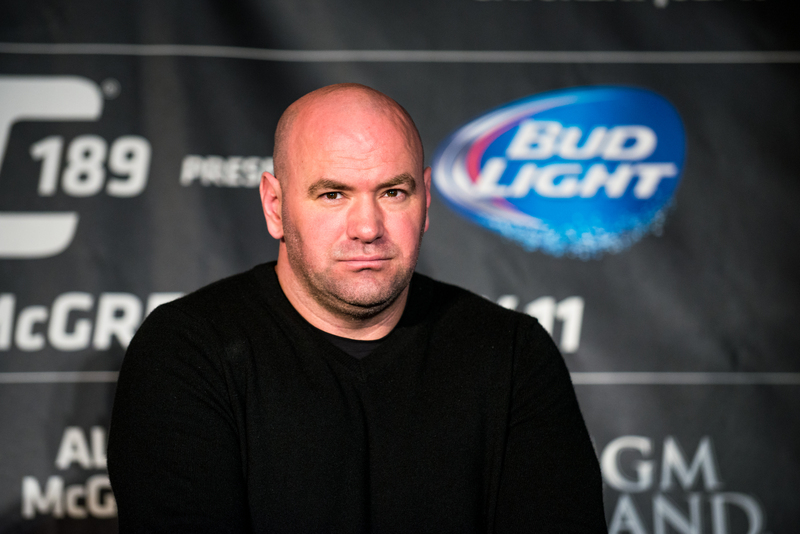 With UFC President Dana White being a friend of Donald Trump and Ramzan Kadyrov sitting in front row seats of big fights, Nathan Young questions if the UFC is too comfortable with far-right leaders. Share the post "The UFC’s far right problem"
If Kadyrov was an obscure figure to the wider world this would still be troubling, but he isn’t. He has managed to build a better relationship with the Russian Federation – without losing support at home – than any other Chechen leader, and has become a patron of a sport growing in popularity around the world, MMA. Readers not familiar with the politics of the Caucasus may instead recognise him from sitting in the front row of many a UFC fight, especially when the fights involve fighters from his own fight club, Akhmat MMA. The club is named after Kadyrov’s father and is run by Colonel Abuzayed Vismuradov, commander of Chechnya’s special police forces and Kadyrov’s personnel security. Despite the undeniable links between the club and the human rights violating Chechen government, the UFC continues to work with them and have signed five fighters from the club onto their roster. It’s not only obscure figures with far right politics who have a close connection with the UFC. President Donald Trump is a fan and patron of the sport, and has been since as early as 2001. At a time when John McCain was calling MMA “human cockfighting”, the UFC was struggling to find a home. With 36 states having banned MMA, Trump offered his Taj Mahal hotel in Las Vegas as a venue, and UFC President Dana White accepted. Ever since then, White has been a vocal supporter of the now president, praising him at press conferences and interviews. When the UFC left Taj Mahal for larger venues, having become a more socially acceptable sport with a larger following, in part thanks to Trump, Trump continued to attend fights. MMA is the perfect sport for strongman politicians to promote their image. Unlike football, there’s no protest movements kneeling to the anthem. Unlike professional wrestling, the violence is real, and the framing of fights is less camp. With many of the fighters, and all of the executives, buying into at least some of the same ultra masculine ideals of the Trumps and Kadyrovs of the world, and the UFC always looking to expand its business, the connection is natural. As well as the ties the UFC itself has to political figures, many fighters are vocal supporters and friends of leaders they admire. Conor McGregor met Vladimir Putin during the 2018 World Cup and afterwards on Instagram wrote, “This man is one of the greatest leaders of our time and I was honored to attend such a landmark event alongside him”. UFC welterweight Abu Azaitar met with King Mohammed VI of Morocco in 2017, and many non-Chechen fighters have had photo ops and meetings with Kadyrov. Like the many men in neomasculinity movements who see Chuck Palahniuk’s (or more likely David Fincher’s film adaptation) Fight Club as a story about the liberating potential of violence against modern sensibilities, MMA is seen as a sport for those rejecting everything else. Unlike Palahniuk’s explicitly anti-consumerist club, however, the UFC is big business. Since the $4.2B purchase mentioned above, the UFC has signed on to a $1.5B contract with ESPN, leading White to claim, perhaps hyperbolically, that the company was now worth $7B. With so much money floating around it’s easy to see why the UFC is unlikely to engage with critics who seek to embrace their executives, sponsors, and allies. The issue goes further than what Amnesty International calls “sportswashing” of far right leaders. The promotion and acceptability of these politics within the UFC is a threat to fans and even fighters. The women’s roster already has many LGBT+ fighters, including bantamweight champion Amanda Nunes (the men’s roster currently has no openly gay fighters). With reports from Chechnya saying the latest rounds of the gay purges are targeting more women than ever before, it’s hard to take the LGBT+ platitudes of people like White seriously. An endorsement of conceptual equality from a man who befriends homophobic and far right leaders during their purges of LGBT+ people is worth naught. For fans, fighters, and LGBT+ people everywhere, the UFC must do better. Anti-Doping Agency, not Anti-Doping Authority.